A Dread Perm is a way for the clients hair to “mature” a lot faster. People committed to real dread locks must first realize what a time commitment and the required maintenance to create beautiful dreads. 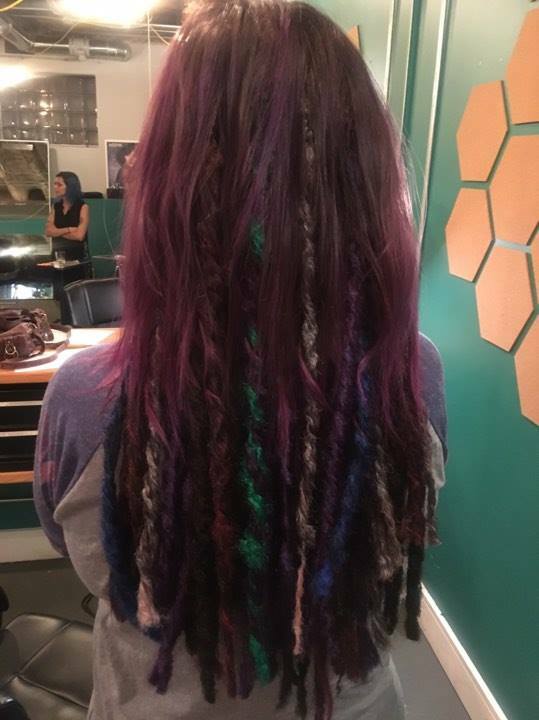 Dread Extensions are a fun way to have dreads without having to commit 100%. Synthetic hair is braided in and rolled to make the dreads. It’s a fun look to try, especially for the summer months and a great way to play with different hair colors. Consultation required for Dreadlocks, Dread Perms and Dread Extensions. Before care, after care and maintenance will be discussed during consultation. Services currently available with Teresa and Chantal only. Please click on their profile for booking information or email Teresa_Tsalon@yahoo.com. We would love to chat with you about your options.